Amnesia, the partial or total loss of memory, has been, and continues to be, an extremely common game mechanic for many titles. Unfortunately, in most cases, the condition is merely used as an excuse for the player, via the main character, to catch up with any plot points or controller settings. In other instances, “amnesia” provides the player with a blank slate to customize an element as they see fit, but this doesn’t create any real lasting contribution to the story, one way or the other. Thankfully, in Torment: Tides of Numenera (TToN), this isn’t the case. 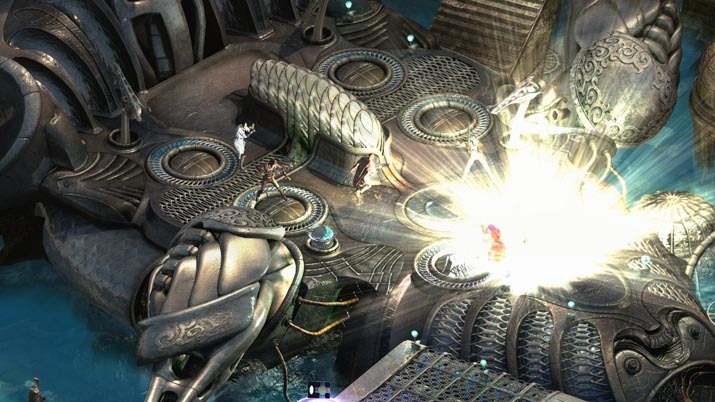 Developed by inXile Entertainment and published by Techland Publishing, TToN presents itself as the digital adaptation of Monte Cook’s sci-fi tabletop RPG Numenera. Both versions take place on Earth about one billion years from now during an era called “The Ninth World.” In this world, many technologies of the past are now forgotten relics that are either used, sold, or entirely misunderstood. Current civilizations have built settlements around many of the structures and ships long abandoned by their original creators. New governments, factions, and religions have risen and fallen with the passing of time, each making their mark in history, or simply succumbing to their own base desires. Humanity progresses in this manner until one day: the day you are born – or reborn. Birthed as a falling star, you awake as your body rapidly plummets towards the planet. A magical force slows your descent; collision into a structure slows it down further, and immediately knocks you unconscious. So begins TToN. At this time, you awake within the subconsciousness of your own mind, piecing together memories, traversing the folds of your mental facilities until you find a mirror filled with potential or past reflections of your true self. Depending on your answers to questions given, you’ll be presented with possible descriptors, though not for who you are, but what. These adjectives provide bonuses or penalties that determine your starting traits. After the descriptor, you’re given the choice of noun you prefer: Glaive, Nano, or Jack (that is: warrior, mage, or rogue). While these choices seem limited, you’ll come to find that combat isn’t the most important factor in TToN. Once everything has been decided, you regain consciousness and can discover what The Ninth World has in store for you. And what a world it is. As you explore and interact with others, you come to find that you are The Last Castoff, the shell of a body once inhabited by the Changing God, a being who creates new forms to continue living, casting bodies off at your caprice. And, you’re not alone in this respect; the Changing God is constantly seeks to upgrade his bodies, never satisfied until he can become truly immortal within a single form, but this messy business leaves behind other castoffs, like you, who are simply trying to eke out a living after being unceremoniously birthed into consciousness. So what does all of this mean? Two very important things: 1) You aren’t special/chosen/etc., and 2) You aren’t out to save the world or prevent any catastrophic disaster. 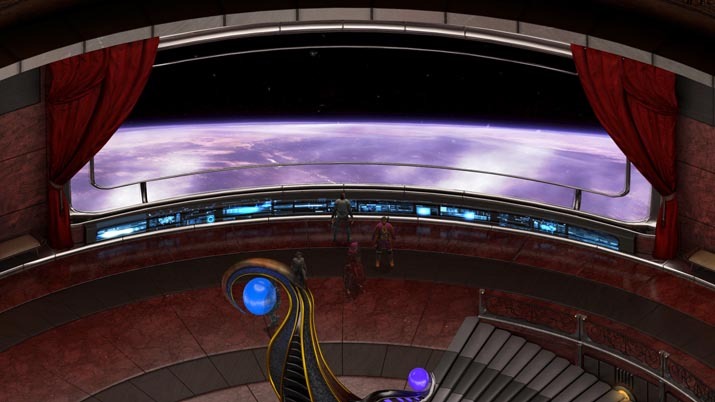 Taking a break from common RPG tropes, TToN places you in the center of a world where you’re not the key to saving civilization from complete and utter destruction. You’re just you, and your choices, interactions, and retinue shape how others see you. 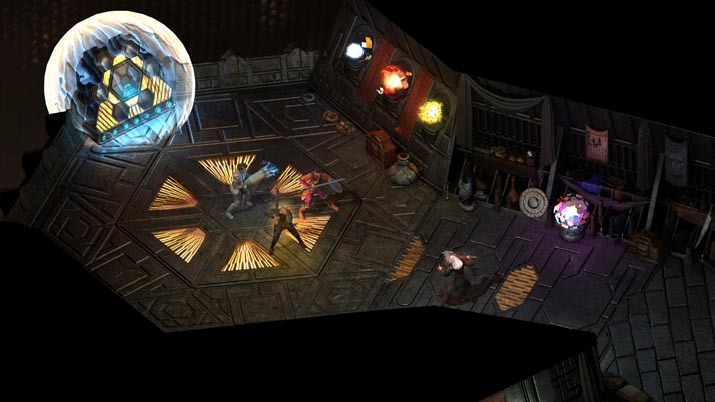 Because these interactions have consequences and weight, TToN presents as a very text-heavy, isometric RPG. These moments are dictated by a player’s choices in dialogue, as well as their “tidal” leanings. Most games only recognize the good/evil dichotomy of morality, but there are plenty of grey areas. The ambiguous zone of morality is seldom explored in a title because, frankly, it can be complex. TToN circumvents this problem via the Tide system, where different color “tides” represent different ideals, decisions, or inspirations to which The Last Castoff may be predisposed. These tides can provide new dialogue trees in conversation, determine how a person feels about you, or decide if an NPC will join your party or leave it. This means that every potentially violent interaction can be solved amicably through words, rather than through brute force. In my first 8 hours of the game, outside of the tutorial, only 1 fight occurred, and even that I was able to diffuse without ever drawing a weapon. The rest of that time was spent talking with other characters, reasoning with individuals, and solving quests through discovery and interactions. 8 hours, no violence: still captivated, and very much invested in the story. TToN is also a very skill-check heavy title. Want to persuade someone to believe your lie? Skill check. Want to salvage some tech from a mysterious item? Skill check. Want to try to remember something? Skill check. All of these checks are performed through a character’s own innate skill, and can be augmented by spending points in might, speed, or intellect to boost your chance of successfully completing them. Of course, your character only has a limited pool from which to draw, and they may not be trained in a particular area, but this is where your companions come into play. Each member of your party has his or her own pools and skills which can be used to augment skill checks in place of yours. Perhaps your castoff is dumb and strong – hopefully you’re traveling with someone who is smart or fast. Depleted all of your pools? Resting refills all of them completely, items can be used to restore a set amount of points, and the occasional critical success may occur, which completely refills the pool that was used for the check. Naturally, you won’t be able to pass all of your skill checks flawlessly. Perhaps you’ve come across an unexpected check for which you’re not prepared, or the points you add only give you a 50% chance of success, and you fail. This isn’t a game over, or necessarily a pathway that is now forever blocked; rather, it’s an opportunity to try something else, or to advance the story down a different path. Failure is not a punishment in TToN: it’s truly part of the journey. Even death isn’t final for The Last Castoff, but merely a time for reflection, ending when you choose to regain consciousness, and that’s really the beauty of this title. Instead of ending your progress abruptly through a bad choice or accidental fall, you’re instead encouraged to continue exploring and growing, trying new things without fear while balancing the thought of potential outcomes. 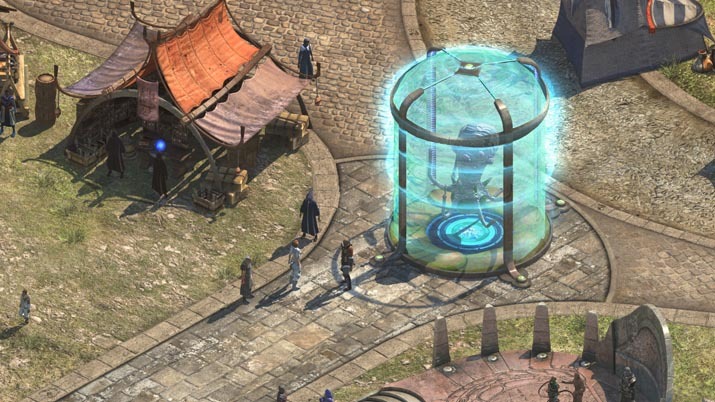 Visually, TToN is fairly attractive for an isometric RPG, but not groundbreaking by any means. Characters are detailed but can become blurry when closely examined. Important characters are distinguishable from common folk; minor characters also have diverse models. The art showcased in items, landscapes, and character models is captivating and adds to the mystery of a futuristic society that feeds off forgotten devices of times past. Set pieces are immense and full of life, consisting of large, explorable expanses. Many areas have distinct architecture and color palettes to provide further variation from scene to scene. Many environments are inter-actable, some ways more subtle than others. Fine touches abound with glowing lights, dust particles, or fog, all helping the sense of immersion. Complementing the visuals are the sound effects, which abound and help bring even more life to the environments. The constant chit-chat and murmuring of crowds, the loud hum of machinery, the distinct hush of entering the red garden – all a constant reminder of where you are, without drowning out dialogue or your own thoughts. Some main characters are wonderfully voiced, and each party member or NPC that does speak sounds believable and competent in portraying the emotion or attitude to properly suit the given circumstance. The real pleasure comes from hearing your party members talk amongst one another, or comment on your regaining of consciousness. Every utterance is enjoyable and helps reify each character. TToN’s soundtrack is ambient, but aggressive when necessary. Mark Morgan’s compositions here are wonderfully executed in a way that adds to the experience without taking center stage. Simple, beat driven sections interrupt peculiar melodies that give a loose impression of futuristic industrial tribes presented with a curious new world to explore. All sounds seem sci-fi in nature, but grounded to a possible reality at the same time. A great accompaniment to a grand story. TToN truly is a grand story, one that respects the intelligence of the player, which is why I’ll not mention any further details. Riveting discoveries and interactions drive the narrative forward while inviting you to dive head first into this very cerebral experience. The writing team, led by designers Adam Heine, Colin McComb, and George Ziets, show their chops throughout this engaging experience, as shown through (not only the many walls of text you’ll encounter, but also) the way everything comes together, like a rubik's cube of moral dilemmas. Don’t let the amount of reading involved scare you away. Discover the treasure of TToN, rich and rewarding for lovers of the RPG genre, new and old alike.